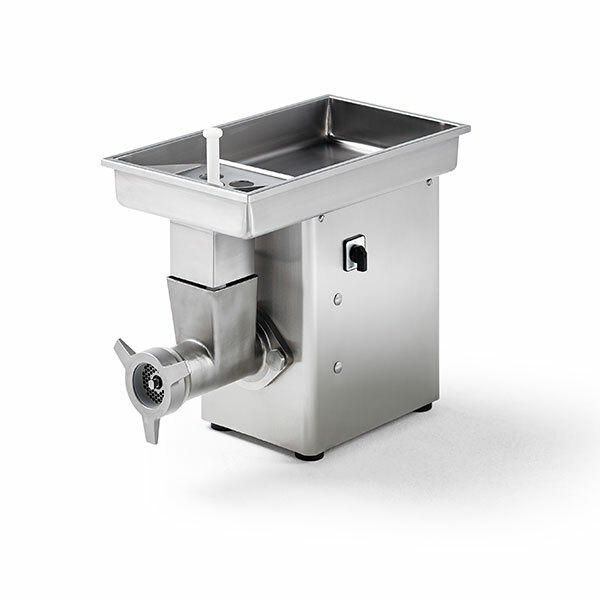 MPBS Industries located in Los Angeles CA 90023 sells Commercial Meat Grinders. Commercial Meat Grinder is a machine used to force meat or meat trimmings by means of a feeding worm (auger) under pressure through a horizontally mounted cylinder (barrel). At the end of the barrel there is a cutting system consisting of grinder knives rotating with the feeding worm and stationary perforated discs (grinding plates). The perforations of the grinding plates normally range from 1 to 13mm. The meat is compressed by the rotating feeding auger, pushed through the cutting system and extrudes through the holes in the grinding plates after being cut by the revolving grinding knives. Simple equipment has only one grinding knife and grinder plate, but normally a series of plates and rotary knives is used. The degree of mincing is determined by the size of the holes in the last grinding plate. If frozen meat and meat rich in connective tissue is to be minced to small particles, it should be minced first through a coarse disc followed by a second operation to the desired size. Enterprise System is mainly used in smaller meat grinders with opening diameter up to 98mm and consists of one grinding knife, sharpened only on the side facing the disc, and one grinder plate. Holes diameter can vary from 13 to 5mm. 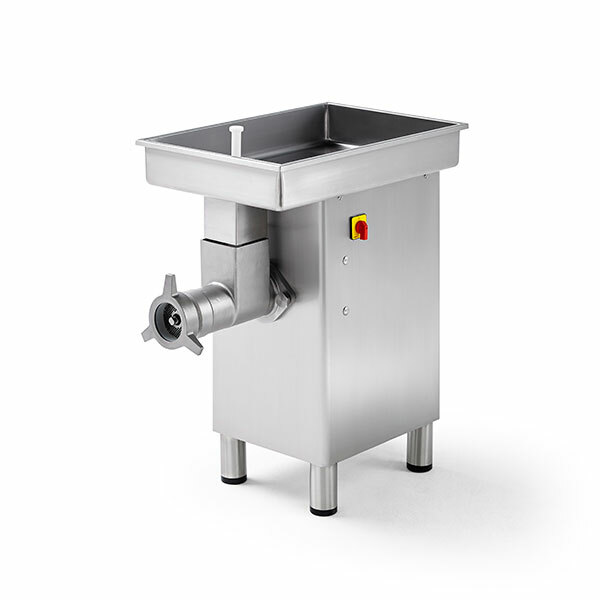 Unger System is used in meat grinders with opening diameter up to 440mm and consists of the kidney plate, one or two grinding knives sharpened on both edges and one or two grinder plates. For a final particle size above 8mm the recommended setting is kidney plate – grinding knife – grinder plate. For a final particle size < 8mm the recommended setting is kidney plate – grinding knife – grinder plate (13mm) – grinding knife – grinder plate (6 to 1mm). 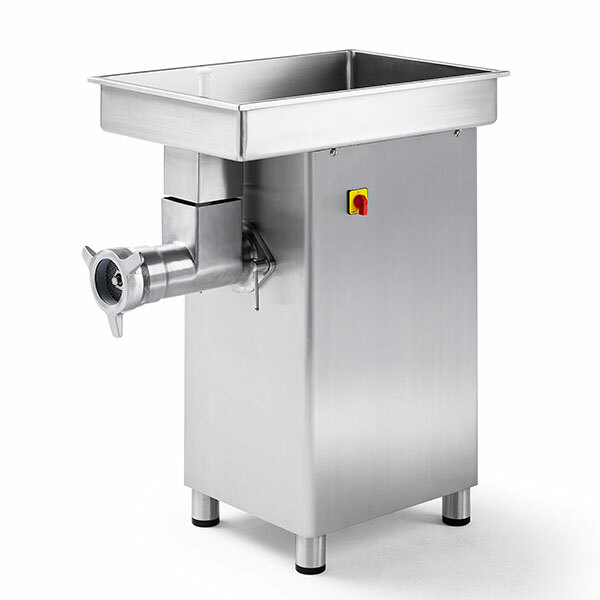 Large commercial meat grinders are driven by a three-phase electrical motor (400 V) and most are equipped with the Unger cutting system. The opening cylinder diameter of this type of grinder ranges from 114 - 400mm.